In a country where open defecation and maintaining toilets remains an issue, self-cleaning, portable and eco-friendly eToilets come as an affordable option. Made by Eram Scientific Solutions, a Kerala-based company, eToilets are India’s first unmanned electronic public toilets. The toilets, which work on a sensor-based technology and have a self-clearing and water conservation mechanism, are maintained and monitored remotely using a GPRS-enabled system. “These are unmanned toilets with an automated access control. There is a remote diagnosis and management through web reports. Waste processing is done through the attached STP (sewage treatment plant),” says Dr Siddeek Ahmed, chairman and managing director, Eram Scientific, which started providing them on a commercial basis in 2010. The first unit was installed in Kozhikode in Kerala, after a movement over lack of toilets by saleswomen working in shops prompted the corporation to approach Eram. 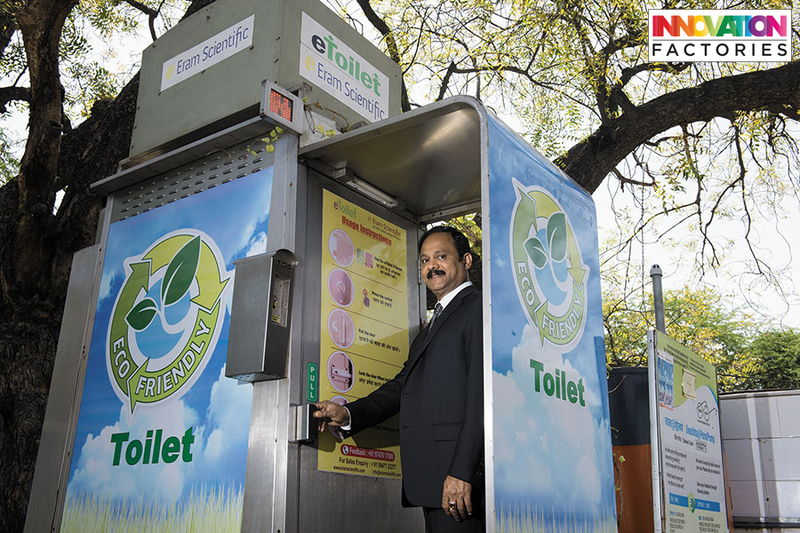 Since then, Eram Scientific has installed over 3,000 eToilets in India and abroad. Buyers of the eToilets include Bruhat Bengaluru Mahanagara Palike (BBMP), Tata Consultancy Services, Kerala Women’s Development Corporation, municipal corporations, panchayats, and cantonment boards. “On World Toilet Day 2018, Indian Railways introduced eToilets in train coaches. While companies like TCS have bought these eToilets as a part of their CSR activities,” says Ahmed. The price of eToilets ranges from ₹2 lakh to ₹20 lakh for different variants including those for the differently abled. Clients can also choose between coin-operated entry and free access to the toilet. Most government and corporate clients choose coin-operated entry (usually Re 1) to avoid misuse while for use in government schools free access is preferred. In rural areas, these toilets are also being funded by MPs, MLAs and local panchayats. Initially, it was a tough job to convince people in rural areas to use the toilets. “Other challenges we faced were vandalism, an attitude of apathy by the public towards public utility systems, lack of ownership from certain customers, difficulties in getting utilities maintained and a serious shortage of experienced manpower for working in the toilet sector,” says Ahmed. But over the years they have tweaked the model based on user feedback as well as created more awareness. A pictorial representation of “how to use” is provided outside the eToilets. “We have also set up a 24-hour helpline to guide and assist users,” says Ahmed. The company has also launched an eToilet app as part of establishing a new Connected eToilet Infrastructure. The app can help one can locate the nearest eToilets via maps and address listings. “In future we’re going to partner with Saudi Arabia for equipping the country with sustainable sanitation solutions. And we are reaching out to more GCC countries to develop comprehensive sanitation solutions,” says Ahmed.